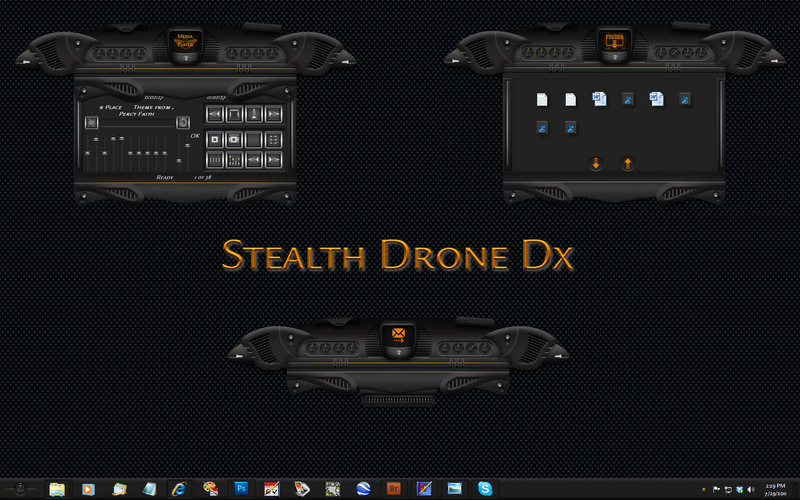 Stealth Drone DX was made to accompany The Stealth Drone Window Blind Made By Xiandi. Permission included in the ZIP file. Main Theme includes 7 sliding drawers. Everything contained in one object. And another drawer contains a folder drag and drop. Other drawers are for internet , programs and whatever else you might want to use them for. Thanks go out to Xiandi, Redneckdude, and wizard for testing. And a big thanks to sViz for the scripts. Some graphics are from the Stealth Drone Blind all other graphics are mine. You did good, kid! Keep it up!!! I could have sworn this was made by Jim. (RedneckDude) A stellar job. Congrats and thank you. Soooooo Coooool!!! Thank you M! Awesome job, again. I'll be looking forward to those icons as well. Cyndie it was a pleasure working with you again. I'll take that as a compliment! Merle was doing DX way before me. I learned by tearing his down and replicating. Personal use, of course. Right up there with Armageddon DX. Fantastic!! !